Place olive oil in a skillet on medium high setting and heat it up for a minute. Add roast and brown it for about 5 minutes per side. (beware of the splatter). While the roast is browning in the skillet, slice up onions and place them in the bottom of crock pot with broth. Then add the roast on top without the drippings from the pan. Place the lid on top and cook on low for 6 hours. Clean and quarter the mushrooms and saute them in the butter until tender on a medium setting for about 10 minutes. Add sweet sherry to skillet (watch out for steam!). Mix with mushrooms and cook 1-2 minutes more. Pour all the mushrooms and juices from skillet into the crock pot. 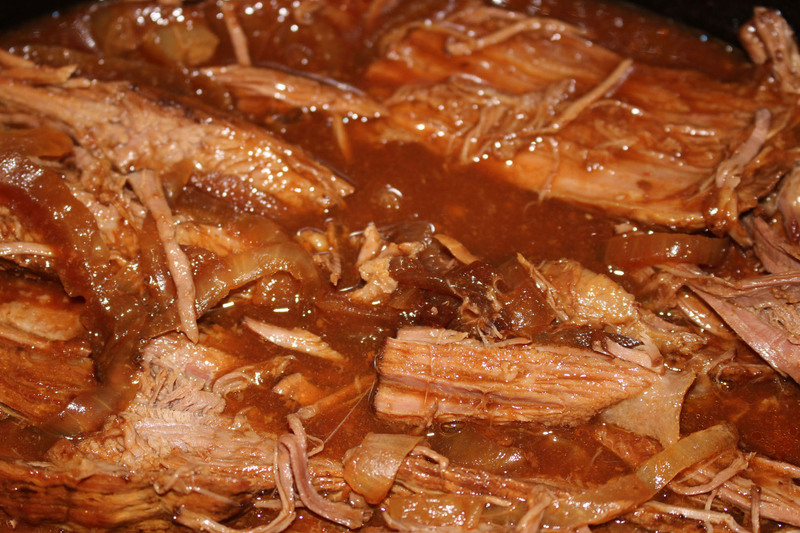 Add the barbecue sauce and cook everything in the slow cooker for an additional 2 hours. After the 8 hours, pull the roast out of the crock pot and let it rest for 15 minutes, then slice it across the grain and place the meat back in the crock pot.